Get this book in kindle format for free! Only five days left for the FREE Deal, Wednesday, September 5th through Monday, September l0th. Surely, you will cherish this heartwarming story which teaches emotional intelligence. Get your e-book now! Adelina Gotera’s first children’s book, Grandma Lives in Us hits a trifecta of giving. She sees a missing niche for stories on death, wants to help children in the Philippines enjoy play, and creates books where parent’s can cast their child as the lead. Gotera was inspired to write the book after watching her daughter deal with a death in the family. The adult characters in the story are modeled after her siblings, and the first scene in the tale actually happened. “It just came to my mind right after my mother’s death in 2009,” she explained. After working with kids for more than a decade, Gotera feels there’s little in the way of a children’s books dealing with death. In Grandma Lives in Us, a young child named Simone finds peace after the death of her grandmother. She learns a little about how, as the title suggests, Grandma lives on through her family, from gentle gestures, to her scent. The illustrations are by Philippine artist Aubrey Tecson; partial proceeds of the book will go to children’s charities in the Philippines, Gotera said. The early childhood education worker visited her ailing mother in the Philippines prior to the elder woman’s death in 2009. Working throughout the school year at StrongStart at Brentwood elementary school — a portable stuffed with bright toys, painting tables and play-dough — Gotera was struck by the contrast of the conditions children play in overseas. While Gotera doesn’t see many parents looking to cast a child in a book about death, she has two other books in the making — both of which will have the option to be personalized. 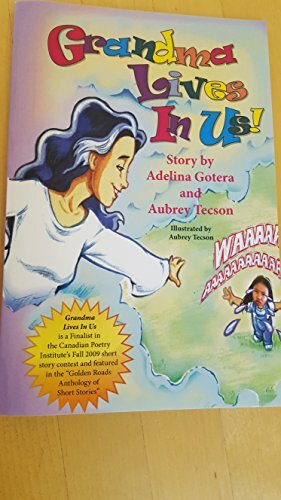 A children’s book like no other, “Grandma Lives In Us” by Adelina Gotera provides a powerful antidote to the poisonous fear of death that so often stunts a child’s behavioral growth and personality development. It tackles the hot-potato subject of death head-on minus the hair-raising shock effect seen in horror or ghost stories. Reading the book, a child is led to a gentle realization of how death is intertwined with life, providing him with an effective shock-absorber and learning tool in coping with such an event when it hits home. For parents who are at a loss on how to properly introduce the subject of death to their young children without inducing fear or stoking grief, the attractive, colorfully designed and easily readable little book serves as a magical key to open their mind to the full realization of the fact that death is just like birth, a natural process of life that should not be traumatic at all. “Grandma Lives In Us” is a book that conquers the fear of death among children. The theme of ‘Grandma Lives In Us’ is death. Although rarely uses as a theme in children’s stories, this book presents death to children in a fascinating way.The death of a loved one can happen to anytime to a family.How can we turn this mournful event into a coming of age moment for our children? Demonstrations of love and affection by the adult members of the family and friends are crucial to the child at these sad moments. These loving gestures encourage the child to accept the sad event gracefully knowing that the love and affection of a dear family member who passed away still exists and lives in the family. Love is magical, transforming sad events to cherished moments.Express love and affection to a child in all the ways you can at this difficult time. Although you are grieving too, you can do it.Let this book help ease the pain of grieving. By reading together, you and your child can discover a more lighthearted view of this sad situation and come one step closer to full acceptance. Jay: Why did you choose death as the central theme of your first book? Adelina: I work with children, and on a regular basis, I visit a nearby public library to borrow books for them. I found out that there are only few books for children which deal with death as a theme. Further, this story just came into my mind a day after my mother's death a year ago. The adult characters in the story were actually my brothers and sisters, scene one actually happened. Jay: How will your story make a difference in the lives of children? Adelina: When a family struggles with the death of a member, the child in the family should not be taken for granted. He/she suffers too just like the adults in the family. I thought that focusing and celebrating the qualities of the deceased member and seeing them in every living member of the family would make the child accept the death of the deceased person because he/she lives on with each living member of the family, with all these similarities of qualities, characters or personal appearance. Jay: What do you think is an effective approach of a parent to a child in the death of a dear and close member of the family? Adelina: At this sad moment in a child's life, the adults should demonstrate love and understanding. Let the child cry, let her release his/her sad emotions. I thought that the child should know the truth, that a beloved member will not be with the family anymore. If the child is ready, the qualities of the deceased person can be discussed and compared with other living members of the family. Discussion here should be light and joyful, it can also be silly as children love to listen to something silly and funny. Grandma Lives In Us, in kindle format, is FREE for a limited time! Friday, March 9 through Tuesday, March l3, 2018. Click on: Grandma Lives In Us and get your Free e-book! Thank you for your visit, and for giving yourself a free copy of my book, Grandma Lives In Us. Happy reading, and may I request a favor? Kindly write an honest to goodness review of the story.